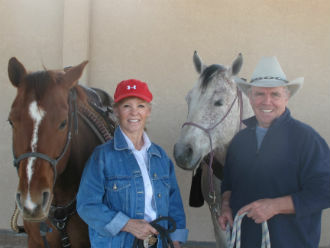 PUEBLO - Gary and Georgia Walker have donated $10,000 to the recently renewed rodeo club team at Colorado State University-Pueblo. The gift will assist the team with travel, entry fees, and other operational needs of the team. The Walkers, along with their children, Cassie, John, and Remington, are graduates of CSU-Pueblo and are interested in growing the team to help increase enrollment at the University as well as promote the sport of rodeo. "We are proud of CSU and CSU-Pueblo and that three generations of our family have graduated from those fine schools," said Gary Walker. "Some of my fondest memories are being part of the rodeo teams at CSU in Fort Collins and CSU-Pueblo, and hopefully our donation will enable young cowgirls and cowboys to gain those same great memories while on the road to their degrees. Pueblo sits in the middle of agriculture country, so there is no reason we can't be champions in rodeo as well as champions in football and other sports." This year, for the first time since its revival in 2015, the CSU-Pueblo Rodeo team competed as a point-earning team in all 10 of the National Intercollegiate Rodeo Association Rodeos within in the Central Rocky Mountain Region and has worked to create partnerships with local rodeo supporters like the Walker family. "The CSU-Pueblo Rodeo team is extremely grateful for the generous donation from Mr. & Mrs. Walker," said Bill Moorman, CSU-Pueblo coordinator of intramural and club sports. "Mr. Walker was part of the CSU-Pueblo- then University of Southern Colorado-Rodeo team, which was renowned for being one of the strongest Rodeo teams in our region. He, alongside his family, have made the return of Rodeo to CSU-Pueblo possible and with their partnership, the team is working to return to its former glory." The CSU-Pueblo Rodeo Club team, a member of the National Intercollegiate Rodeo Association, was reinstated in 2014 after being discontinued in the early 1990s. Prior to being disbanded, the rodeo club team was regarded as one of the best in the region. For more information about the Rodeo Club team, or any other CSU-Pueblo club sports, contact Moorman at 719.549.2087. For more information on the CSU-Pueblo Foundation Board, scholarships or giving to the CSU-Pueblo Foundation, contact CSU-Pueblo Foundation Communications and Stewardship Director Sammi Mutz at 719.549.2469 orsammi.mutz@csupueblo.edu.